With our medication dispenser, clients can manage and organize their medication intake. For those 80 or older, according to the Centers for Disease Control, nearly two-thirds (65.7%) of all hospitalizations were caused by medication non-compliance, drug interactions, or overdoses – with the biggest culprits being blood – thinning – agents and diabetic medications. Medication intake is easily managed with an Around the Clock Medical Alarms Medication Dispenser with or without the monitoring capability of the Emergency Response System. Load Medication into the slots. Program the Medication Dispenser by setting dispensing times to remind you to take your medication. A lock in the lid will prevent overdosing and tampering with medication. A clock on the top of the unit is convenient and easy to read. In addition to the Stand Alone functionality, the Monitored System works in conjunction with the medical alarm. This partnership enables the Response Center to go to the extra efforts to remind the subscriber to take their medication. 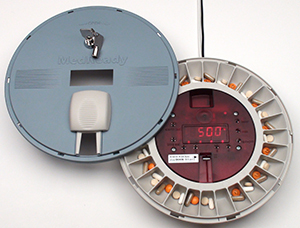 A special transmitter is installed in the Medication Dispenser that will activate the Medical Alarm System if medication has not been taken within 30 minutes of the alarm sounding. At that time, the Medical Alarm System will actually call the Response Center. An attendant will try to contact the subscriber over the PERS unit or telephone. If the attendant is unable to make contact, a responder will be notified.